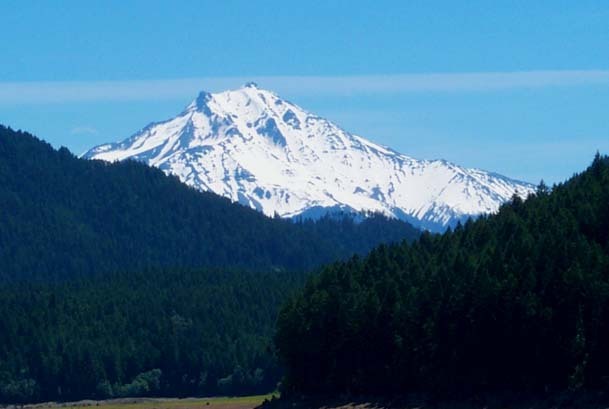 Mount Jefferson is a 10,495 feet (3,199 meters) high stratovolcano. It is the second highest in the Oregon Cascade Range, falling second only to Mount Hood by a mere 800 feet. 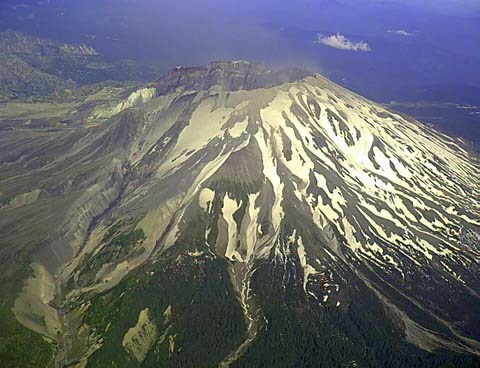 Mount Jefferson last erupted about 15,000 years ago and has shown it has the potential for “large explosive eruptions.” It is home to the Russel, Jefferson Park, Whitewater and Waldo Glaciers. 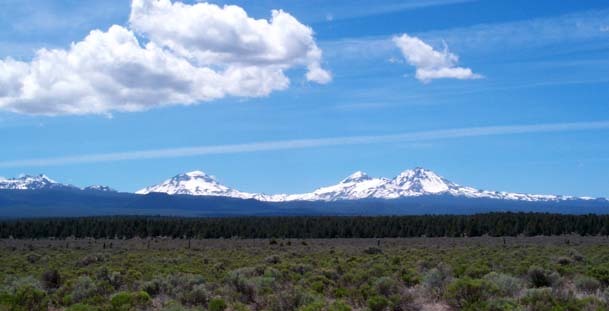 Good viewpoints can be found along Highway 20 as you travel east around Detrot Lake and from Bend to Sisters, OR looking west from the east side of the Cascade Range. If you want to take a hike, try Pamelia Lake and then on up to the top of Grizzly Peak for spectacular views. Further south of Mount Jefferson you will find Mt. Washington. You must obtain a wilderness permit to enter the protected Mount Jefferson Wilderness. You can obtain these permits at the Detroit Lake Ranger Station on Highway 20. 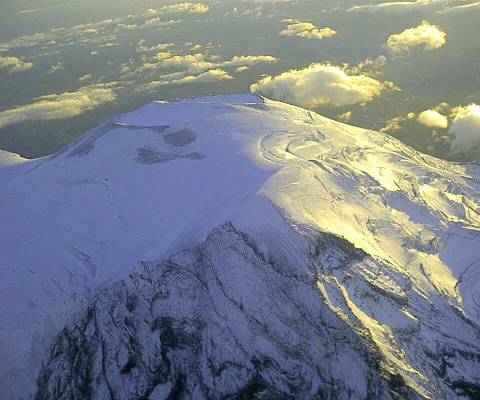 You can see cracks in the glacier all over the bright southeast face of Mount Rainier. Look directly into the crater at the top! 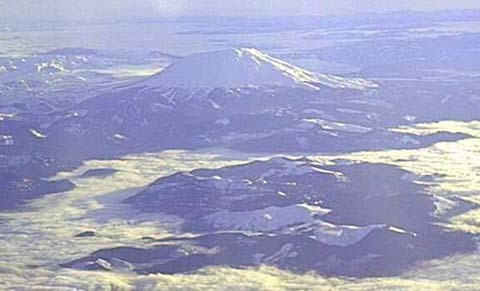 Mount Saint Helens is famous for it’s May 18, 1980 eruption, spewing smoke and ash as far east as Montana. 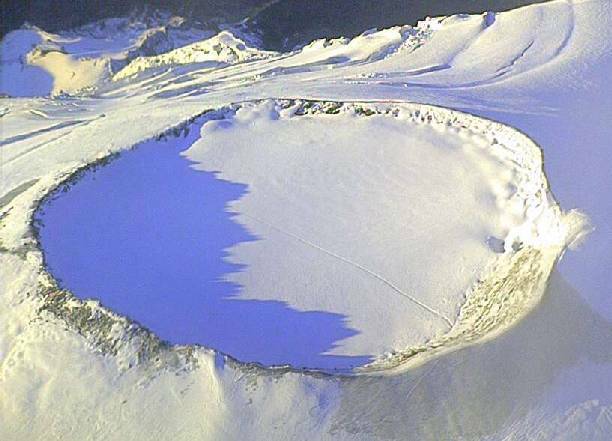 It is now 8,364 feet (2,549 M), before the eruption it was 9,667 feet high. Both the North and South forks of the Toutle River were flooded with mud flow and debris. Spirit Lake, north of Mount Saint Helens, has a large portion of it’s surface area covered with floating logs. Twenty years later these logs are still floating and can be seen easily from the air. Mount Saint Helens covered in winter snow. In 1987 the southern slope of the mountain was reopened to hikers. For more information please call the Climbing Information Line at (360) 247-3961. Mount Adams is located in the southern portion of Washington, east of Mount Saint Helens. Mount Adams is 12,276 feet (3,742 M) high. Pictured here looking east in late September, the morning sun is beginning to peek over the south face of Mount Adams. Mount Hood, Oregon, base shrouded in low clouds. Pictured here in mid-march, just after sunrise, is mighty Mount Hood. A few islands of land poke through the clouds in the foreground. On a clear day Mount Hood can be seen from Portland, OR. At 11,245 feet(3,426 M) it is the highest in the Oregon Cascade Range, rivaled only by Mount Rainier.